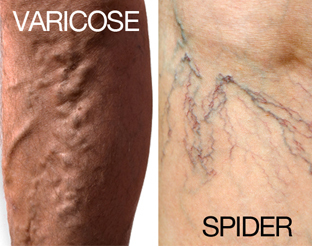 How are spider veins different than varicose veins? Home » Spider Veins » How are spider veins different than varicose veins? They get their name from the “web” of discoloration that typically spreads across legs or behind the knees with age. Spider veins, also known as telangiectasia, look like a cluster of thin, dilated veins that appear close to the surface of the skin. They’re red, blue or purple in color, and are smaller than varicose veins. Telangiectasia can develop anywhere in the body (even the brain and the whites of the eyes) but are mostly seen on the legs, abdomen, and face. Both spider veins and varicose veins are the result of weak or damaged valves in veins where blood is traveling back to the heart, and both can appear in the same areas on the body. People with a family history of spider veins are prone to getting them, but they can also occur among people who stand for long periods of time; individuals with light skin who get too much sun exposure; those experiencing hormone changes due to pregnancy or menopause; and people who are overweight. Spider veins appear with age and are common for people over the age of 50. While they’re abnormal-looking, spider veins often times present no symptoms. However, they can trigger discomfort or itching, swelling, throbbing and restless legs. Pain, blood clots, and ulcers may occur in extreme cases. Sometimes spider veins are indicative of an underlying disorder, such as Osler-Weber-Rendu syndrome (also known as HHT), a genetic disorder that causes blood vessels in the skin to bleed excessively, or Sturge-Weber disease, a rare disorder that causes dark birthmarks and nervous system issues. Treatment for spider veins and varicose is similar, and today’s medical procedures are safe and effective. Removal methods include sclerotherapy (the injection of a chemical into the vein, causing it to collapse and close), laser treatment and surgery. Let West Florida Vein Center, a division of Surgical Associates of West Florida, help you eliminate painful and unsightly varicose and spider veins for good. Call 727-712-3233 to request a consultation, or visit http://www.westfloridaveincenter.com for more information.